Warm Buffalo Chicken Dip is is made with shredded chicken, cream cheese, boursin cheese, blue cheese dressing, and Franks’s Red Hot sauce. This recipe is super easy to make. It’s so tasty that it will be the hit at any tailgating or game day party. You can cook it on the stove top or in the crock pot. Super easy! 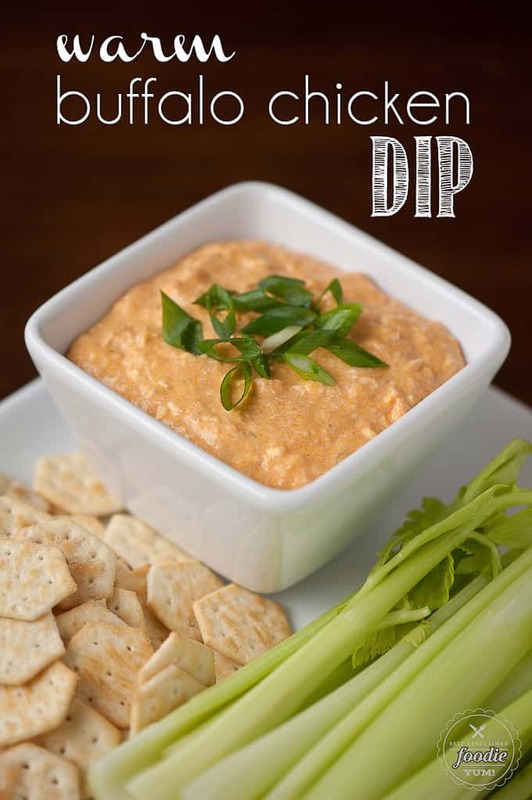 Buffalo Chicken Dip is quite possibly the easiest game day appetizer. It’s quick. Buffalo chicken dip is easy. It’s also loaded with flavor. If you’re looking for a super easy to make, pour the ingredients in the pot and stir kind of warm cheesy tip, look no further. This dip is mighty darn tasty, if I do say so myself. The boursin cheese adds saltiness and a lot of flavor. The cream cheese makes it, well, creamy. The blue cheese gives it that buffalo chicken tang. And the cayenne pepper sauce doesn’t make it spicy, but gives it that bite you look for with buffalo chicken. This recipe is about as easy as it gets. Seriously. The only ingredient you even really have to measure is the blue cheese. All you need to do is put all of the ingredients in a small pot on the stove and heat it on low until everything is melted and heated through. Then, you can transfer it to a small crock pot to keep it warm. Alternatively, you can cook and serve your Frank’s buffalo chicken dip entirely from the stove top. Or, you can throw everything in the crock pot, set it to low, give it a good stir every so often, and serve it from there! No matter how you choose to cook this recipe, Frank’s Red Hot buffalo chicken dip is a crowd favorite. As long as you serve it warm with tasty dippers, it will go fast! Same story. Simply combine all five ingredients together in a casserole dish. Then, instead of cooking on the stove top or in a crock pot, stick your casserole dish in the oven. You’ll want to cover the buffalo chicken dip and cook it until it’s heated through. 350 degrees F for about 20 minutes should do the trick! What is the best buffalo chicken dip recipe? Okay, okay. You know I’m biased. I wouldn’t recommend this recipe if it wasn’t outstand and easy to make. This is the best buffalo chicken dip recipe you will find. Most buffalo chicken recipes are somewhat similar. They usually included cooked chicken, Frank’s Red Hot Sauce, bleu cheese, and cream cheese. I took my recipe a bit further and added Boursin cheese because it melts wonderfully and adds the perfect amount of flavor to set this warm Buffalo chicken dip apart from the others. What kind of chips go with buffalo chicken dip? 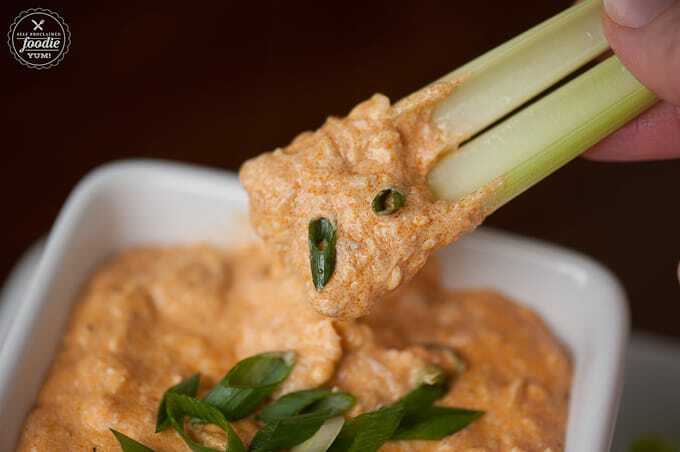 I prefer to serve my buffalo chicken dip with crackers or celery. 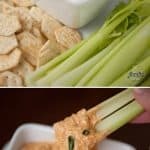 Be sure your celery pieces are no longer than 3 inches long otherwise you’ll get people double dipping, and it is cold and flu season after all! If you want to serve the dip with chips, you can’t go wrong with a basic tortilla or potato chip. I would stay away from any flavored chips as the dip is already packed with a ton of flavor. I also highly recommend unsalted chips as the buffalo chicken dip has enough salt from the Frank’s Red Hot sauce as well as the boursin cheese. This recipe calls for shredded chicken. In order to get shredded chicken, it should really be cooked whole with the bones and skin. If you cook single cuts of meat like chicken breasts, it’s not as tender or flavorful when you shred it. You can easily go get a rotisserie chicken and use some of the meat from that. I suppose you can use canned chicken but since I’ve never used it myself, I can’t tell you if it will taste good. I know this isn’t the easiest method, but I highly recommend cooking the whole chicken yourself. Not only can you get more than one meal out of it and use the leftover shredded chicken for this dip and things like chicken salad, but you can use the bones and skin to make broth. When I made the chicken for this recipe, I covered it with my dry rub and roasted it on the grill. Another favorite method is to cook a whole chicken in the Instant Pot. Just as easy, you can cook a whole chicken in the slow cooker. And last, but not least, I love me a good dutch oven roasted chicken. This Warm Buffalo Chicken Dip is super easy to make and is so tasty that it will be the hit at any tailgating or game day get together. Add all ingredients to pot and stir over medium heat until completely melted and smooth, about 10-15 minutes. Transfer to a small slow cooker set to warm setting to keep dip warm while serving. Serve with fresh cut celery and crackers. makes about 4 cups. Serving size based on 1/4 cup. My husband would LOVE to snack on this next time the Seahawks play 😉 Maybe I’ll be a good wife and whip some up for him!! Thanks for the recipe. OK, this is one of the recipes I ALWASY make my daughter bring to gatherings. 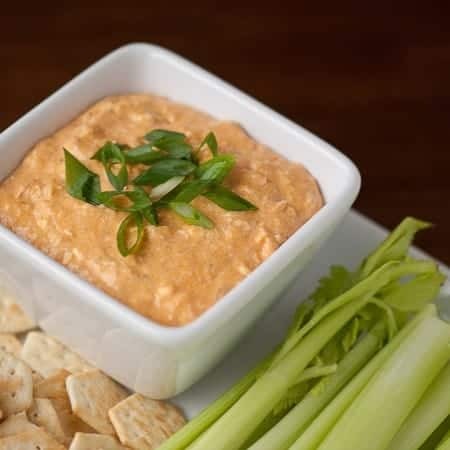 However, I am soooo trying your Warm Buffalo Chicken Dip, as we never made it with boursin cheese, blue cheese dressing, I knwo it is super easy to make, which make sit the perfect potluck bring-along! I could seriously make a meal out of this! It sounds so tasty and comforting! I use Franks Hot Sauce a TON and love it. Looking forward to trying this buffalo chicken dip for my guys over the holidays!